For the first time, BYU slides up to number one in the VM Top 25. That’s because the top three all lost, and BYU was responsible for downing #1. That gives them the best win in the country thus far, and a sweep of Wichita State to follow along with wins over Power 5 opponents WVU and Duke (twice) make the Cougars number one, with another big test this week. The Cardinal were dethroned at the number one spot, was it was a tough five-set loss on the road, so they only drop one spot with all of the other chaos occurring. This week will either affirm that or make a larger drop as they welcome a pair of top ten Big Ten opponents into Palo Alto. The Badgers are another team making a big rise up the rankings behind their win against #3 Texas, in which they outscored the Longhorns 98-80. They’ve got all kinds of balance, and Dana Rettke has still yet to really ramp things up. A challenge comes this week down in Texas, but the Badgers look legit in 2018. Minnesota has the talent of one of the best teams in the country, the reason they’re at number four is because while impressive to this point, they don’t have any wins over teams ranked or on the cusp in the VM Top 25. Their top three perceived wins – over FSU, UNC and Arkansas – have a combined 6-9 record, with their entire slate owning a 9-19 mark. So if they get one or two of those big wins – with chances this week – they should skip ahead in the rankings. The Trojans would have had a great case and likely been number one had they finished the week unbeaten after downing Florida on the road. However, of all their matches so far – their first four coming against ranked opponents and the sixth against (RV) Louisville – it was UCF to knock them off. Still, they have the top group of four wins in the country thus far, so they still move up, but the loss created a missed opportunity. Texas had a glorious first week, downing Oregon and Florida. They were halted though in their first road test of the season against Wisconsin. Still, they look to be a title contender and will have their shot against Stanford twice next week to prove it. They can’t look ahead though, with Kentucky on the ledger this week. The Gators started the year off with a bang winning at Nebraska, but then faltered in five versus Texas and now lost at home in an Elite Eight rematch to USC. Still, they’ve got plenty of talent and the rest of the schedule sets up nicely for Florida to rack up wins as they did against solid Louisville and UCF teams. The Huskers don’t fall for doing anything wrong, it’s just the nature of the business in the first few weeks that if teams right below you earn huge victories they catapult up the rankings. Playing in the Big Ten and a couple of ranked opponents this week, they’ll have ample opportunities to move up. The Nittany Lions haven’t played anyone who jumps off the page, but they’ve also dominated and won all 15 sets of action. Now they’ll get a chance to prove this week if that will translate to ranked opponents for the young Penn State team. The Fighting Illini were a bit shaky in the first weekend – downing a good CSU team in five but also being pushed to five by Northern Colorado. That seems to have been just a one-off though, as Illinois swept Colorado and added Washington to their Pac-12 victims as they move into the top 10. The Bruins squeaked by Baylor in an incredible five set match before doing a similar task against host-team San Diego. The young core of the Bruins looks ready to be near the top in the Pac-12 in 2018, while this week’s challenge at Cal Poly and the Van Winden sisters will be unique both in terms of a player storyline, an NCAA Tournament rematch and a high-level match. The Huskies had their first setback at home to Illinois, but it wasn’t a bad loss by any means. They still have those two wins over San Diego from week one – which look better after this week – and downed a Big Ten foe in Iowa to keep them right near the top 10. Pittsburgh saw the return of Stephanie Williams and still boasted a balance attack with multiple ways of winning. While they did down Cal Poly in week one, this week against Washington will be a true test of where this team belongs in the rankings. None of Creighton’s opponents this week jump off the page, but all were solid and they won all nine sets. They’ll get their first home matches this week, but first a meeting at Chi Health Center in Omaha against in-state foe Nebraska. Baylor did beat a solid North Texas squad, but were stopped twice. Still, one came in a easily switchable loss to UCLA while the other was on the road against a top 25 opponent in San Diego. They’ll get a chance to rebound this week at home against Wisconsin. The schedule eased off a bit for Kentucky, but there were still moments of difficulty for the Wildcats. It was a positive overall to earn three victories, including coming back from down 0-2 on Kansas as they get another test against a ranked foe this week at Texas. Washington State took down Northern Iowa twice at home, a difficult task. That adds onto their impressive opening week as Taylor Mims continues to star for the offense. The Ducks bounced back from a down opening week by not losing a set. Still, the real challenge comes if this team can get over the hump against the top teams, which they get another crack at this week. The Wolverines have still yet to play anyone of note, but they’ve won all 15 sets. Their opposition ramps up this week, with formerly on the cusp LSU and current on the cusp opponent Colorado State ahead. The Boilermakers mix of returners and young talent has worked well so far, and they sit at 5-0. Notre Dame should be near an NCAA Tournament team in 2018, so that win was a positive step. They’ll look to continue building positively with the match against Louisville as a highlight this week. San Diego was able to bounce back from two straight losses to Washington with a big home win over #13 Baylor. They couldn’t shake away Pac-12 struggles though, as they came up just short against UCLA and the Bruins. Tennessee is an underrated foe who beat Michigan State though, so they’ll have a challenge twice this week. The Golden Eagles only loss came at Baylor, but besides that they’ve won all of their other 15 sets of action. The experience and talented bunch will be tested at home this week as a 2-1 record would do wonders. The Utes were upended in the first week by Saint Mary’s, a lower tier WCC team. 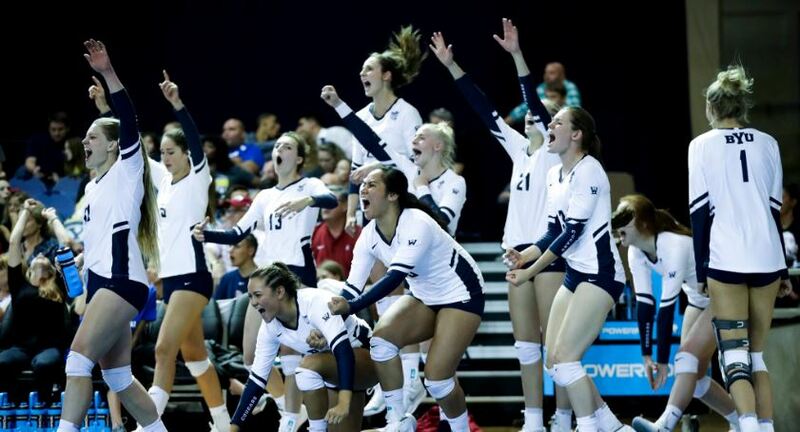 That came in five sets and might have just been growing pains though, as they bounced back powerfully this week with a trio of sweeps, including against Iowa State to push them into the top 25. Iowa State has been a bit inconsistent, losing to Oregon State and Utah out of the Pac-12 but also beating Ole Miss and Northern Iowa in sweeps. A big opportunity sits ahead this week too in the state of Nebraska. The Panthers looked great in week one taking down Kentucky and Creighton on neutral courts, but for whatever reason couldn’t do much playing at home. They’ll look to turn it back around this week playing in Indiana.